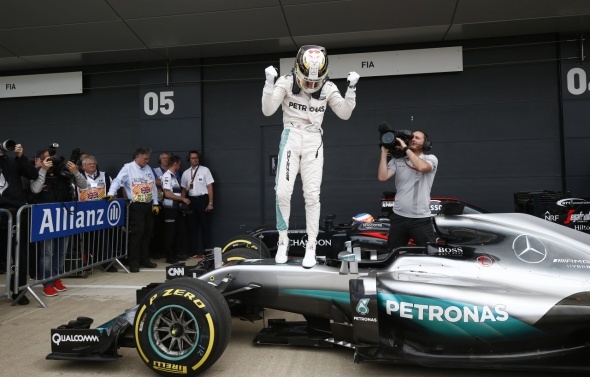 Lewis Hamilton took pole position at the British Grand Prix for the fourth time in his career during a dramatic final shootout session at Silverstone. Hamilton, who set a new lap record in Q2, collected provisional pole position with a time of 1:29.339, almost three-tenths clear of team-mate Nico Rosberg. However, the stewards deemed that he exceeded track limits and deleted his time, elevating Rosberg to top spot. Hamilton responded on his second run to move clear at the top with a 1:29.287 while Rosberg was unable to improve and will start from second. Max Verstappen led Red Bull’s charge throughout qualifying and will start third, albeit a second down on Hamilton, in front of team-mate Daniel Ricciardo. Kimi Räikkönen survived a messy Q2 session to take fifth while Sebastian Vettel was a subdued sixth and will start only 11th due to another gearbox penalty. Valtteri Bottas thus inherits sixth place, in front of Carlos Sainz Jr., Nico Hulkenberg and Fernando Alonso, the latter two having their best Q3 times deleted. Sergio Pérez narrowly failed to make it through to Q3 and placed 11th, ahead of Williams driver Felipe Massa. Haas took 13th and 14th courtesy of Romain Grosjean and Esteban Gutiérrez, two-tenths separating the pair, while Daniil Kvyat was 15th for Toro Rosso. Kevin Magnussen secured a rare Q2 appearance for Renault but was significantly adrift of the pace and took 16th spot. Jenson Button failed to clear the first hurdle in qualifying after completing only one flying lap and placed 17th, while Jolyon Palmer was eliminated in Q1 for the ninth successive race. Manor drivers Rio Haryanto and Pascal Wehrlein were 19th and 20th, with the Indonesian edging out his team-mate by 0.053. Felipe Nasr struggled with the handling of his Sauber C35 and was only 21st, 0.4s down on Wehrlein. Marcus Ericsson did not participate in the session following routine hospital checks as a result of his crash during the final practice session.